I loved these gorgeous Pink Paislee Vintage Moon papers when I bought them, and I still do! 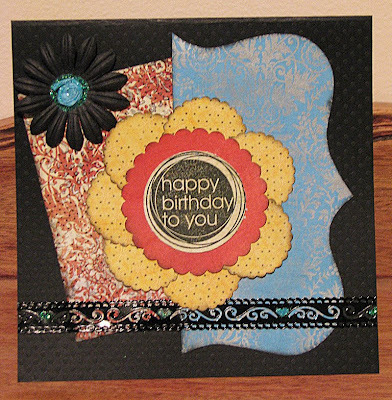 This card is the second of Liz's birthday card projects. Loved making this cute flower in the middle. I used my giga and mega punches, and just hand cut out that shape on the right. 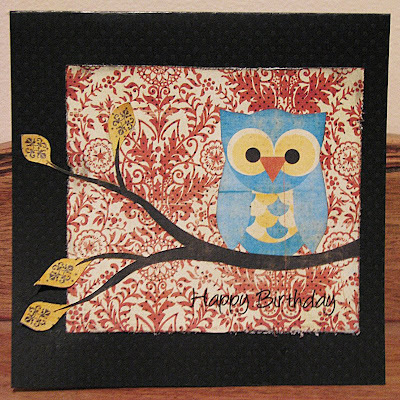 Love the vibrancy and the variety of patterns in this range too, and hoo could resist this cute little owl! :) I've cut him and the branch out, and I've used Helen's technique of raising the edges of the leaves with some scrapdots! Thanks lovie for the excellent tip!!! Mwah!! Loving the owl one! Just so cute. Great colours and of course Liz's ideas are always so much fun to try. Mmmm like the owl one on the Black dotted swiss CS Leah.Did you cut him out??? You have as much patience as Helen Sis!!!! Gorgeous work Leah - I so LOVE that Vintage Moon paper and you have used it beautifully on the projects. I have loved checking out all your gorgeous work here and once you start going digi you will LOVE it but yes you won't ever give up paper scrapbooking, it's way too much fun and takes you away from the computer which I think is very important. Enjoy your dabbling in digi though!